The series follows a struggle rapper who runs for mayor. Aol Build, ABC, Katie Couric, Charlie Rose and more, what a crazy week it's been. And the outfits I keep getting to wear, oh man ... Shoutout to @commedesgarcons for keeping me fly at every turn. ABC has picked up a new, as yet untitled, comedy series "[centered] on a struggling hip-hop artist who runs for mayor to promote his mixtape – and wins," reports Deadline today. 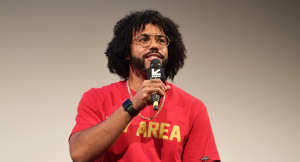 Signed on to executive produce said show is Daveed Diggs, the frontman for experimental rap trio clipping., and more recently, the Tony Award-winning star of Hamilton. The last few months have been busy for Diggs, who parlayed his role in the Broadway smash into appearances on Black-ish and The Get Down, and joined his clipping. bandmates to drop a 6-song EP in June. Diggs won't act in the project, but he'll be joined as a producer by writer Jeremy Bronson, known best for his work on Late Night with Jimmy Fallon and The Mindy Project. Full story here, via Deadline.